Pregnancy implantation is when a fertilized egg (embryo) implants into the lining of the uterus (the endometrium/endometrial lining) and occurs during the luteal phase of your ovulation cycle. At ovulation the egg is released from the dominate ovarian follicle from the wall of the ovary and 'grabbed' up by the fimbria and pulled into the fallopian tube. This is where and when conception occurs (the fertilization of the egg by the sperm) just inside the tube where sperm are anxiously waiting. The follicle which held the mature egg will go through changes induced by LH (luteinizing hormone) and FSH (follicle stimulating hormone) (which are both tapering off after their spike just before ovulation. This follicle becomes what is now called the corpus luteum and will produce hormones (most notably progesterone and estrogen) to continue to prepare your body for possible pregnancy. 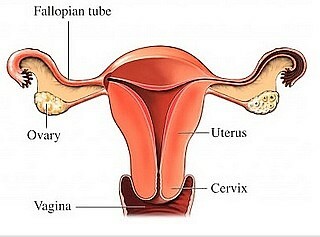 After human egg fertilization, it then travels down the fallopian tube by the cilia (little hair like projections lining the fallopian tube) and tiny contraction movements of the tube. By the time the embryo reaches the uterus (about 4 to 6 days past ovulation/conception) it has multiple cells of growth already. And will begin to shed it outer lining (generally referred to as hatching or zona hatching) to reveal a set of cells (called trophoblasts) designed to dissolve the lining of the uterus and allow it to burrow and attach itself to the endometrial lining. The lining is fully prepped to receive the fertilized egg with many blood vessels which will feed the embryo once it has buried into the lining. The embryo will be in the uterus for about another 3 days before finding a spot to bury into. Once it finds a spot the trophoblast cells eat away at the lining of the uterus which pulls it further into the lining and ultimately to establish a connection with the blood supply of the mother. This takes about 3 or so days and the embryo will then be fully enclosed by the lining. How long does egg implantation take? Pregnancy implantation itself takes about 3 to 5 days to completely bury into the endometrium, so a total of about 9 to 12+ days from ovulation to embryo implantation. However, if you have a short luteal phase (luteal phase defect), which is generally defined as less than 10 days, then this does not provied enough time for implantation to take place and you cannot become pregnant. When pregnancy implantation is finished you are now officially pregnant. At this time the embryo has established a connection to the mother (through the blood supply of the endometrium) and emits hormones including hCG (human chorionic gonadotropin). hCG is the hormone that is detected by pregnancy tests. It's generally called the pregnancy hormone. This hormone signals the corpus luteum (the follicle that the egg came from) that embryo implantation has occurred and will continue to transmit estrogen and progesterone for continued support of the pregnancy. It generally takes hCG about another 3 to 5 days to be at levels high enough to be detected by home pregnancy tests. So in total about 14 to 16 days from ovulation (normally when your period id due) before it can be detected in the bloodstream by home pregnancy tests (this time is generally referred to as the two week wait). Extra sensitive tests can detect the hCG as soon as 9 to 10 days past ovulation depending on when the embryo implanted (which is different for everybody and every pregnancy). Had the corpus luteum not received the signal form the embryo (not detecting the hormone hCG in the bloodstream) the the corpus luteum will begin to degenerate and eventually die off. Producing a drop in progesterone which then signals the uterus to expel it's contents (lining, unfertilized egg, fertilized egg that did not implant). IE you get your period. So now pregnancy implantation has occurred at about 10 days past ovulation (DPO) and your body is preparing itself for the development of your growing baby. If you are charting your basal body temperature (BBT) with a basal body thermometer (bbt thermometer), then you may notice a slight dip the temperature that coincides with the timing of egg implantation. this is generally called the implantation dip. It is believed that this occurs because the corpus luteum started to produce less progesterone (higher progesterone levels produce a higher temperature and vica versa lower progesterone levels produce lower body temperatures) just before it then received the signal hcg from the embryo that in fact implanted, and therefor a pregnancy, has taken place. At this time it begins to again produce progesterone at a higher rate. Also a second thermal shift as progesterone continues to rise. Of course, if pregnancy implantation does not occur, then the your basal body temperature will drop as a result of the drop in progesterone and you will get your period. The embryo cells already began forming different parts . One part will form the baby (fetus) the other part will form the placenta (from the trophoblast cells). The placenta will take over hormone production at about 10 weeks gestation. And is then after referred to as a fetus.